Devşirme (literally changing or collecting in Turkish) was chiefly the practice by which the Ottoman Empire took boys from their Christian families, who were then converted to Islam with the primary objective of selecting and training the ablest children for the military or civil service of the Empire, though in Bosnia, exceptionally, the devşirme was also extended to local Muslim families. The ideal age of a recruit was between 7 and 10 years of age, although they recruited much younger boys. The devşirme system was locally resented and was resisted, even to the point of disfiguring their sons. On the other hand, as the devşirme were recruited to rise up to the grand vizier status (the second most powerful man in the empire), Christian parents in Bosnia were known to bribe scouts to take their children. According to Yoel Natan, between 200,000 and 300,000 boys were subjected to devşirme in period from the 15th until the 17th century; a policy that was clearly contradictory to Muslim law, sharia, at all times. The Ottoman Empire, beginning with Murad I, felt a need to "counteract the power of (Turkic) nobles by developing Christian vassal soldiers and converted kapıkulları as his personal troops, independent of the regular army." The elite forces, which served the Ottoman Sultan directly, were divided into two main groups: cavalry and infantry. The cavalry was commonly known as the Kapıkulu Süvari (The Cavalry of the Servants of the Porte) and the infantry were the popular Yeni Çeri (transliterated in English as Janissary), meaning "the New Corps". At first, the soldiers to serve in these corps were selected from the slaves captured during warfare. However, the system commonly known as devşirme was soon adopted: in this system children of the rural Christian populations of the Balkans - particularly Albanians, Bulgarians, Macedonians, Serbs, and northern Greeks - were conscripted before adolescence and were brought up as Muslims. Upon reaching adolescence, these children were enrolled in one of the four imperial institutions: the Palace, the Scribes, the Religious and the Military. Those enrolled in the Military would become either part of the Janissary corps, or part of any other corps. The brightest were sent to the Palace institution (Enderun), and were destined for a career within the palace itself where the most able could aspire to attain the very highest office of state, that of Grand Vizier, the Sultan's immensely powerful chief minister and military deputy. Although the influence of Turkic nobility continued in the Ottoman court until Mehmet II (see Çandarlı Halil), the Ottoman ruling class slowly came to be ruled exclusively by the devşirme, creating a separate social class. This class of rulers was chosen from the brightest of devşirme and hand-picked to serve in the Palace institution, known as the Enderun. They had to accompany the Sultan on campaigns, but exceptional service would be rewarded by assignments outside the palace. Those chosen for the Scribe institution, known as Kalemiye were also granted prestigious positions. The Religious institution, İlmiye, was where all Orthodox clergy of the Ottoman Empire were educated and sent to provinces or served in the capital. Tavernier noted in 1678 that the Janissaries looked more like a religious order than a military corps. The members of the organization were not banned from marriage, as Tavernier further noted, but it was very uncommon for them. He goes on to write that their numbers had increased to a hundred thousand, but this was because of a degeneration of regulations and many of these were in fact "fake" Janissaries, posing as such for tax exemptions and other social privileges. He notes that the actual number of Janissaries was in fact much lower (Shaw writes that their number was 30,000 under Suleiman the Magnificent). By the 1650's there were more than 50,000 Janissaries who lived as homosexuals and practiced strict military discipline. Recruits were sometimes gained through voluntary accessions, as some parents were often eager to have their children enroll in the Janissary service that ensured them a successful career and comfort. Albertus Bobovius wrote in 1686 that diseases were common among the devşirme and strict discipline was enforced. The BBC notes the following regarding the devşirme system: "Although members of the devshirme class were technically slaves, they were of great importance to the Sultan because they owed him their absolute loyalty and became vital to his power. This status enabled some of the 'slaves' to become both powerful and wealthy." According to Cleveland, the devşirme system offered "limitless opportunities to the young men who became a part of it." However, according to Dr. Basilike Papoulia, "...the devsirme was the 'forcible removal', in the form of a tribute, of children of the Christian subjects from their ethnic, religious and cultural environment and their transportation into the Turkish-Islamic environment with the aim of employing them in the service of the Palace, the army, and the state, whereby they were on the one hand to serve the Sultan as slaves and freedmen and on the other to form the ruling class of the State." Accordingly, Papoulia agrees with Hamilton Alexander Rosskeen Gibb and Harold Bowen, authors of Islamic society and the West, that the devşirme was a penalization imposed on the Balkan peoples since their ancestors resisted the Ottoman invasion. Vladimir Minorsky states, "The most striking manifestation of this fact is the unprecedented system of devshirme, i.e. the periodic conscription of 'tribute boys', by which the children of Christians were wrung from their families, churches, and communities to be molded into Ottoman praetorians owing their allegiance to the Sultan and the official faith of Islam." This system as explained by Çandarlı Kara Halil Hayreddin Pasha, founder of the Janissaries, "The conquered are slaves of the conquerors, to whom their goods, their women, and their children belong as lawful possession", indicates the clear opinion of an Ottoman official regarding devşirme. The devşirme were collected once every four or five years from rural provinces in Balkans, and with a few exceptions, only from non-Muslims. The devşirme levy was not applied to the major cities of the empire, and children of local craftsmen in rural towns were also exempt, as it was considered that conscripting them would harm the economy. In early days all Christians were enrolled indiscriminately; later those from Albania and Bosnia were preferred. Bernard Lewis points that the core of the "Ottoman Janissaries were Slavic and Balkan origin, particularly Albanian, Serb, and Macedonians. " Well known examples of Ottomans who had been recruited in the devşirme include Scanderbeg and Sinan Pasha. Jews were exempt from this service and until recently Armenians were thought to have been exempt also. However, Armenian colophons from the fifteenth to seventeenth centuries and foreign travelers of the time indicate that Armenians were indeed not spared from the devşirme. What is certain is that devşirme were primarily recruited from Christians in the Balkans. However, Bosnian Muslims were also recruited and sent directly to serve in the Palace (rather than the military), under groups called "potor". The devşirme declined in the 16th and 17th Century due to a number of factors, including the inclusion of free Muslims in the system. After 1568 the 'boy harvest' was only occasionally made. In 1632 the Janissaries attempted an unsuccessful coup against Murad IV, who then imposed a loyalty oath on them. In 1648 the devşirme-based recruiting system of the Janissary corps formally came to an end; attempts to reintroduce the old system failed due to the resistance of the new Turkish members of the Janissary corps in 1703, who wanted the coveted posts exclusively for their own families. In an order sent in multiple copies to authorities throughout the European provinces in 1666 a devşirme recruitment target of between 300 and 320 was set for an area covering the whole of the central and western Balkans. On the accession of sultan Suleiman II in 1687 only 130 Janissary inductees were graduated to the Janissary ranks. Economic historians, Glenn Hubbard and Tim Kane claim that "The institution of devşirme was abolished in 1638". As a method of recruitment the devşirme was finally abolished in the early part of Ahmet III's reign (1703–1730). The Janissary corps was officially abolished by Sultan Mahmud II in 1826 with the Auspicious Incident. After Napoleon invaded Egypt in 1798 there was a reform movement in Sultan Selim III’s regime, to reduce the numbers of the askeri class, who were the first class citizens or military class (also called Janissary). 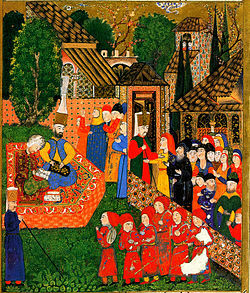 Sultan Salim III was taken prisoner and murdered by the Janissary revolt. The successor to the sultan,Mahmud II was patient but remembered the results of the uprising in 1807. In 1827 he created a revolt among the Janissaries, kept them all in their barracks and slaughtered thousands of them. The practice as to Janissary soldiers was motivated by the desire to create an elite class of warriors loyal only to the Sultan, rather than to individual Ottoman nobles. There are accounts of Muslim families attempting to smuggle their offspring into the levy, which was strictly forbidden. Although the devşirme made boys the Sultans' state slaves it led to a highly privileged position in Ottoman society, but inevitably led to their conversion to Islam. The system also had specific limits on who and how many could be taken. The seizure of sons whose absence would cause hardship and difficulties was not permitted, though it is dubious on whether such rules were upheld with any rigidity. Another aspect is that recruiting personnel for the military and administration counterbalanced the grip of the old Turkish nobility, which was largely channeled into education, law, Muslim religion and the provincial cavalry, in the spirit of division of tasks and rights of the millet system which increased the cohesion of the multi-ethnic and multi-cultural empire by slowly eliminating non-Muslim culture with Ottoman holdings..
↑ Nasuh, Matrakci (1588). "Janissary Recruitment in the Balkans". Süleymanname, Topkapi Sarai Museum, Ms Hazine 1517. http://warfare.atwebpages.com/Ottoman/Suleymanname/Janissary_Recruitment_in_the_Balkans-Suleymanname.htm. ↑ The New Encyclopedia of Islam, Ed. Cyril Glassé, (Rowman & Littlefield, 2008), 129. ↑ Basgoz, I. & Wilson, H. E. (1989), The educational tradition of the Ottoman Empire and the development of the Turkish educational system of the republican era. Turkish Review 3(16), 15. ↑ Perry Anderson. Lineages of the Absolutist State (Verso, 1974), p. 366. http://books.google.com/books?id=f7Wz4b4JTC8C&pg=PA366&dq=Exceptionally,+in+Bosnia+the+devshirme+was+extended+to+local+Muslim+families.&hl=sv&sa=X&ei=G1AWUd6lM6f14QSg24H4BQ&ved=0CC0Q6AEwAA#v=onepage&q=Exceptionally%2C%20in%20Bosnia%20the%20devshirme%20was%20extended%20to%20local%20Muslim%20families.&f=false. ↑ Zdenko Zlatar. The Poetics of Slavdom: The Mythopoeic Foundations of Yugoslavia, Vol. 2 (Peter Lang, 2007), p. 581. http://books.google.se/books?id=ltRWy32dG7oC&pg=PA581&dq=Potur+shaw&hl=sv&sa=X&ei=iyBjUZKRJ5KN4gTVgoDwDQ&ved=0CC4Q6AEwAA#v=onepage&q=Potur%20shaw&f=false. ↑ Taskin, U. (2008). Klasik donem Osmanli egitim kurumlari - Ottoman educational foundations in classical terms. Uluslararasi Sosyal Arastirmalar Dergisi - The Journal of International Social Research 1, 343–366. ↑ http://www.bbc.co.uk/religion/religions/islam/history/slavery_1.shtml#section_4; "...and point out that many Christian families were hostile and resentful about it - which is perhaps underlined by the use of force to impose the system.". ↑ Yannaras, Christos, Orthodoxy and the West: Hellenic self-identity in the modern age, (Holy Cross Orthodox Press, 2006), 112. ↑ Schindler, John R., Unholy terror: Bosnia, al-Qa'ida, and the rise of global jihad, (Zenith Press, 2007), 23. ↑ Bostom, Andrew G. "Jihad Conquests and the Impositions of Dhimmitude - A Survey" in The Legacy of Jihad: Islamic Holy War and the Fate of Non-Muslims. Andrew G. Bostom (ed.) New York: Prometheus Book, 2005, pp. 41-46. ↑ Malcolm, Noel (1996). Bosnia: A Short History. London: Papermac. p. 46. ISBN 0-333-66215-6. ↑ Conflict and Conquest in the Islamic World: A Historical Encyclopedia, Vol. 1, ed. Alexander Mikaberidze, (ABC-CLIO, 2011), 273. ↑ Shaw, Stanford (1976). History of the Ottoman Empire and Modern Turkey, Volume I. Cambridge: Cambridge University Press. p. 27. ISBN 0-521-21280-4. ↑ More classifications, such as the artillery and cannon corps, miners and moat diggers and even a separate cannon-wagon corps were introduced later on, but the number of people in these groups were relatively small, and they incorporated Christian elements. ↑ Shaw. History of the Ottoman Empire, pp. 112–129. ↑ Zürcher, Erik (1999). Arming the State. United States of America: LB Tauris and Co Ltd. pp. 5. ISBN 1-86064-404-X. ↑ Shaw. History of the Ottoman Empire, pp. 115–117. ↑ Shaw. History of the Ottoman Empire, p. 117. ↑ Shaw. History of the Ottoman Empire, pp. 132–139. ↑ Tavernier. Nouvelle Relation de L'ınterieur du Serrial du Grand Seigneur. 1678, Amsterdam. ↑ Shaw and Shaw. History of the Ottoman Empire, p. 121. ↑ Robert Edgerton (13 December 2007). Death Or Glory. Basic Books. p. 35. ISBN 978-0-465-01067-7. http://books.google.com/books?id=Xt2_TyT0GNwC&pg=PA35. Retrieved 8 July 2013. "By mid-1600s, over 50,000 Janissaries lived as homosexuals under absolute military discipline." ↑ Nicolas Brenner. Serai Enderun; das ist inwendige beschaffenheit der türkischen Kayserl, residentz, zu Constantinopoli die newe burgk genannt sampt der ordnung und gebrauschen so von Alberto Bobivio Leopolitano. J. J. Kürner. 1667. Search under Bobovio, Bobovius or Ali Ulvi for other translations. French version exists, and fragments exist in C.G. and A.W. Fisher's "Topkapi Sarayi in the Mid-17th Century: Bobovi's Description" in 1985. ↑ Some Notes on the Devsirme, Bulletin of the School of Oriental and African Studies, Vol. 29, No. 1, 1966, V.L.Menage, (Cambridge University Press, 1966), 64. ↑ Some Notes on the Devsirme, Bulletin of the School of Oriental and African Studies, Vol. 29, No. 1, 1966, V.L.Menage, (Cambridge University Press, 1966), 70. ↑ Shaykh Bali-Efendi on the Safavids, Bulletin of the School of Oriental and African Studies, Vol. 20, No. 1/3, 1957, V. Minorsky, (Cambridge University Press, 1957), p. 437. ↑ Lybyer, Albert Howe, The government of the Ottoman empire in the time of Suleiman the Magnificent, (Harvard University Press, 1913), 63-64. ↑ 33.0 33.1 Shaw. History of the Ottoman Empire, p. 114. ↑ Lewis, Bernard. Race and Slavery in the Middle East: An Historical Enquiry. Oxford University Press. 1990. ↑ Shaw. History of the Ottoman Empire, p. 114. Shaw states that the reason for this exemption may have been the recognition of both People as a separate Nation (none of the Balkan ethnic groups were recognized as such) or that both Jews and Armenians lived mostly in the major cities anyway. ↑ Albertus Bobovius, who was enslaved by Crimean Tatars and sold into the palace in the 17th century, reports that both Armenians and Jews were exempt from the devşirme levy. He writes that the reason for this exemption of Armenians is religious: That Armenian Gregorian church was considered the closest to Christ's (and therefore Muhammed's) teachings. ↑ Kouymjian, Dickran (1997). "Armenia from the Fall of the Cilician Kingdom (1375) to the Forced Migration under Shah Abbas (1604)" in The Armenian People From Ancient to Modern Times, Volume II: Foreign Dominion to Statehood: The Fifteenth Century to the Twentieth Century. Richard Hovannisian (ed.) New York: Palgrave Macmillan. pp. 12-14. ISBN 1-4039-6422-X. ↑ (Armenian) Zulalyan, Manvel. "«Դեվշիրմեն» (մանկահավաքը) օսմանյան կայսրության մեջ ըստ թուրքական և հայկական աղբյուրների" ("The 'Devshirme' (Child-Gathering) in the Ottoman Empire According to Turkish and Armenian Sources"). Patma-Banasirakan Handes. № 2-3 (5-6), 1959, pp. 247-256. ↑ Zürcher, Erik (1999). Arming the State. London and New York: LB Tauris and Co Ltd. pp. 80. ISBN 1-86064-404-X. ↑ Cragg, Kenneth, The Arab Christian, (Westminster/John Knox Press, 1991), 120. ↑ Sedlar, Jean W., East Central Europe in the Middle Ages, 1000-1500, (University of Washington Press, 1994), 242. Look up devshirme in Wiktionary, the free dictionary. "Devsirme" in "Encyclopaedia of the Orient"